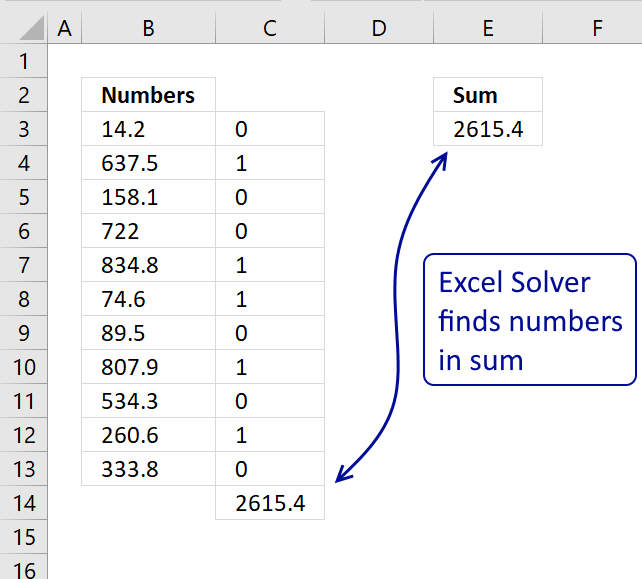 Here is a useful feature I recently found googling for Excel solver examples. I have summed some random values from the list A1:A11 in cell C1. How do I find those summed numbers in C1? I am going to use Excel Solver. 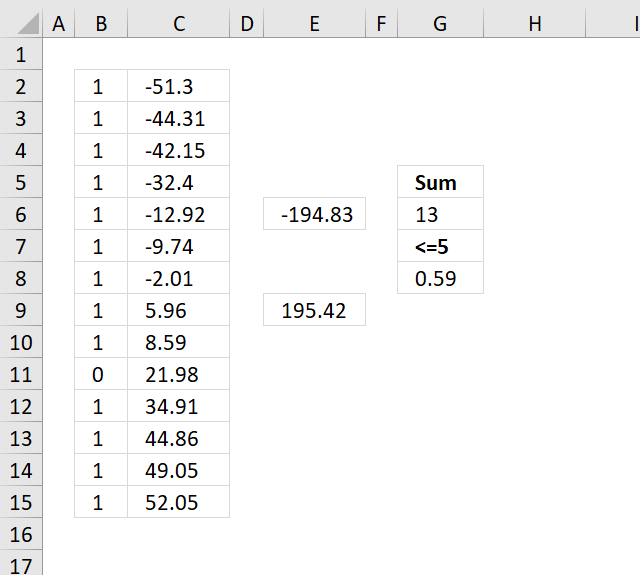 Using more than 20 values (Column A) is not recommended unless you have a lot of spare time. 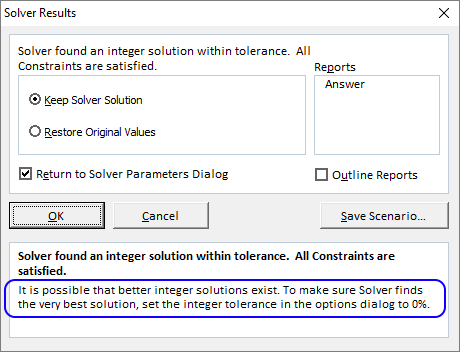 Interested in what other things Excel Solver can do? See category for Solver. Click "By Changing Cells:" button and select B1:B11. 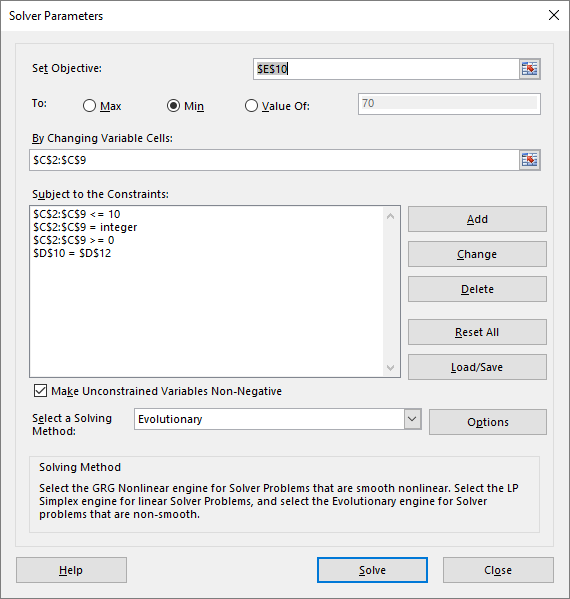 If you have a newer Excel version and can't find "Assume Linear Model", select Simplex LP in "Select s Solving Method" drop down list. You are ready, ignore steps below. Click "Solve"A couple of minutes later. 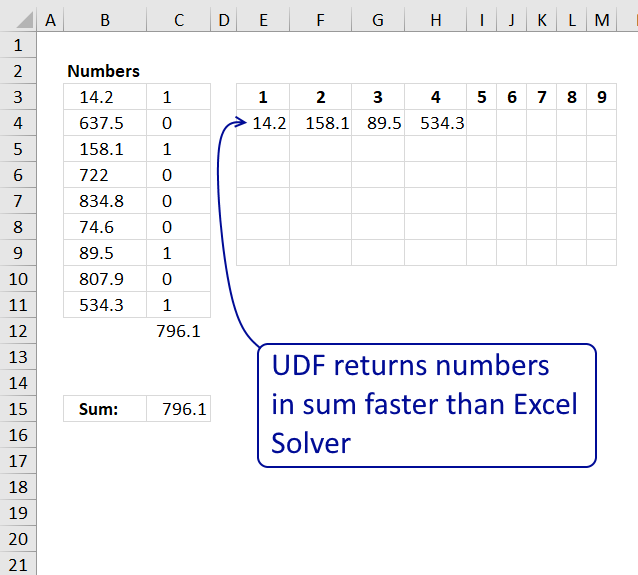 I found this solution of idendtify number in sum using solver in excel. its great. but i couldnt find excel solver in my office 2010.
i have did the same to install solver add in in excel option and then click on solver add in and then okay. but later i went to Data ribbon and couldnt find Solver option. There seems to be something wrong with your excel version. 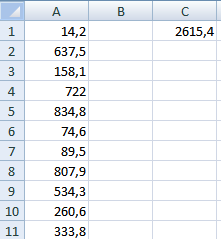 I am using excel 2007 and I have no clue. 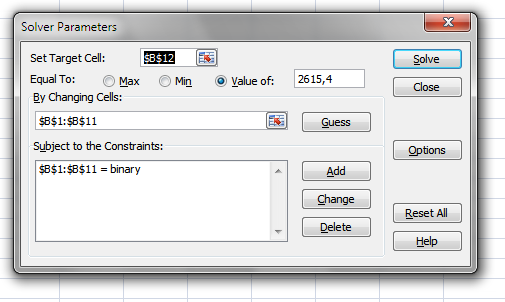 Yes, it would take (almost) forever to calculate 362 cells. You cannot use more than 100 variables when trying to find the sum of variables using solver. 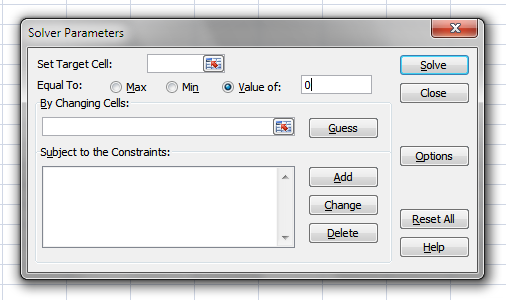 Also cannot have more than 200 constraints. It helped me a great deal instead of having to find all the possible combinations to get the value i require. is there any other formula to this operation? Thank you so much! This is exactly what I was looking for. What a time saver! Would love to have this run with a click of a button with some VBA, looks like my next see if its feasible project. To be completely honest, I didn’t like it! I simply LOVE IT! 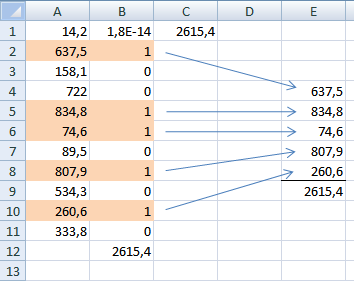 I always knew that Excel should be able to do this, but never realized how I could do it on Excel, so thanks a lot for sharing it! I’m still trying to figure it out a way to have this method on a template, where I won’t need to call and setup the solver, whenever I need to use it. Anyway thank you very much for the time you took to share with the community. I have a range with around 100 cells. Is there anyway to do a range that large? 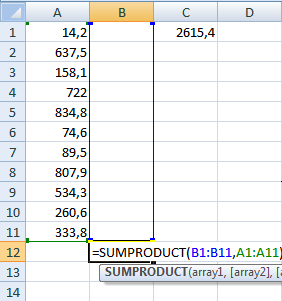 You can use Excel add-in called SumMatch. It will show all possible combinations, not just one. Hi, Thanx for the informative article. However, the one major problem in using this solver function is that it takes a lot of time for finding the optimum solution if the quantum of data is huge. In my field of work there are upto 10,000 rows and 5,000 colomns.. 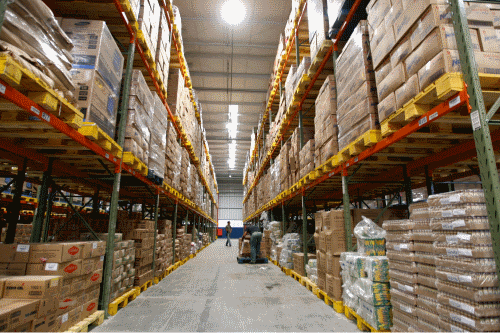 Hence finding a particular amount from such a huge database become difficult for excel. Too Many adjustable cell... error said. what to do next sir? Thank-you for this fantastic solution. You just saved me a ton of time trying to figure out variables that don't work for a solution. I tested this with numbers I knew would work and it's perfect! Finally, a use for Solver in my work. 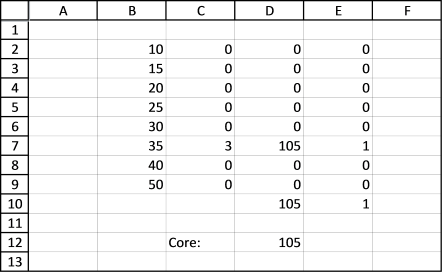 Im using excel 2010, my main problem is that whenever i set the solver and it validates a range of around 20 cells the number i get after i hit solve is not the exact target number i put. Concerning the binaries that give us the ability to identify the combination of numbers is giving me 0.27 for some numbers. I can't identify the problem, can it be that our client just paid wrong invoices? Or maybe a mistake have happened? 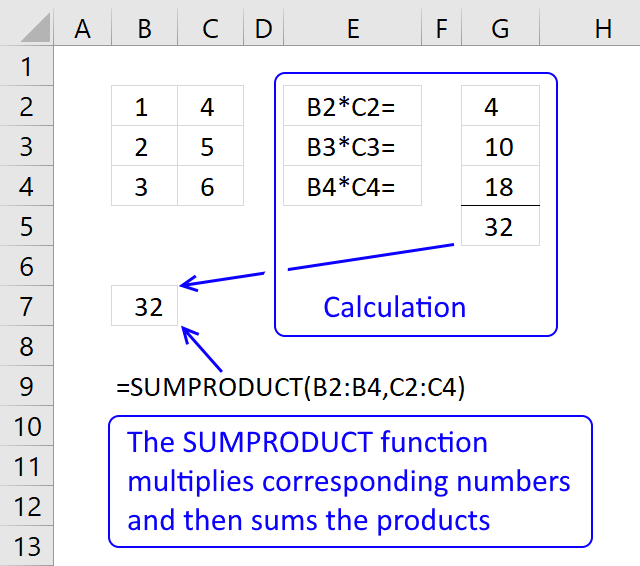 This is a neat solution to finding values used in a SUM function, but it does not take into account if there are 2 or more possible combinations of values which can be used to achieve the SUM amount. I'm very interested to find out if there is a method of identifying all possible combinations of values. 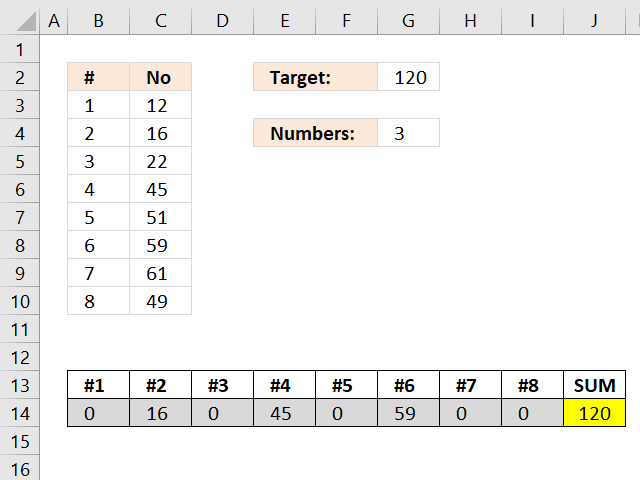 Also, what happens using this method if there are duplicate values in the list of numbers. I need a method, So when the sum of the values is not equal to the value in "Value of", then it gives me the sum of values less than the value in "value of"
I need to help to try to solve a problem using Excel Solver. I work for a manufacturing company and we make cores in heights totalling from 10 to 300mm. If we receive an order for a core of over 50mm in height, say 75mm height, then we can "stack" two or more cores with say a 50 & 25mm or 40 and 35mm. 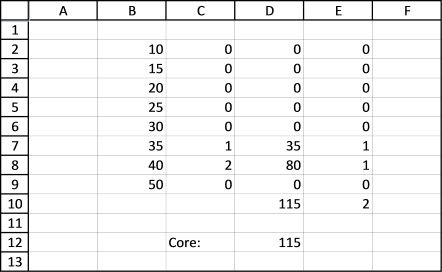 I would like to use solver to identify possible combinations using the fewest number of cores to produce the stack. 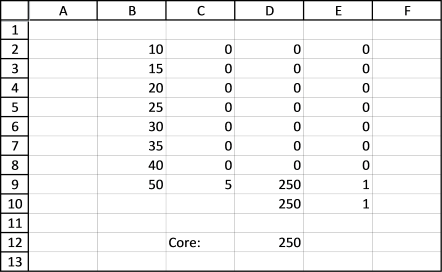 The only other constraint is that as well as wishing to use as few cores as possible, I would then also like to minimize the different combinations. 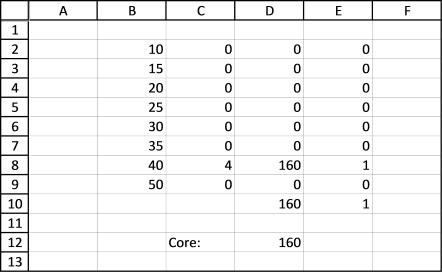 So to achieve a core of 105mm in height I could use 2 x 40mm cores plus 1 x 25mm but I would prefer using 3 x 35mm as it means I am using all the same size. Similarly for larger cores it would be better to use two different types and three etc. Interesting question, unfortunately excel hangs after a while. I have tried multiple excel versions and computers. I don't know why. "Lower and upper bounds on variables allow no feasible solutionSome upper bound on a Variable Cell is smaller than a lower bound on that same Variable Cell." NB Wasn't sure why "Value Of: 70" although like you I then selected "Min"
I think you got the less than and greater than signs wrong? Check these constraint lines again. Sorry, that was an old value I forgot to delete. I tried with a solution I know works but it is not the optimal solution and let the solver work from there. It then finds another solution but unfortunately not the best solution. 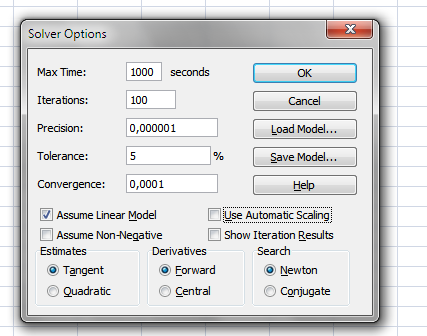 Solver has performed 5 iterations for which the objective did not move significantly. Try a smaller convergence setting, or a different starting point. Unfortunately it won't find the best solution. The solver displays a message on the statusbar for each iteration, this slows down the calculations considerably and I believe it was done on purpose. They want you to buy their products. I re-typed my formula's to make sure I input them correctly. I input 250 in d12 and hit solver expecting solver to tell me 5x50 i.e. 5 in C9. Is that correct? "Solver cannot improve the current solution. All constraints are satisfied." I also tried 115 and 160 in d12 and they all return the optimal solution, if I use GRG NonLinear. 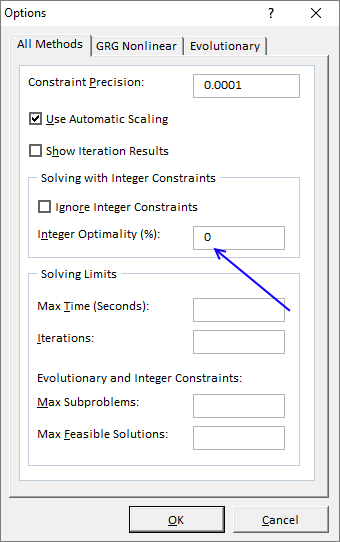 and this telling me to change integer tolerance to 0% in the options. 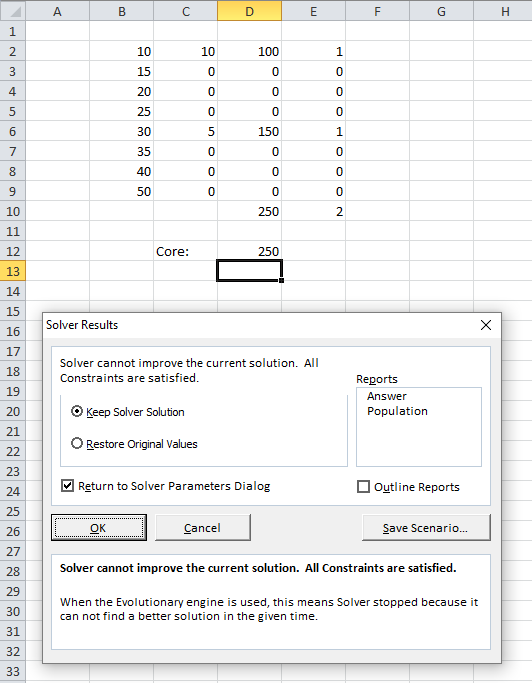 but solver returned the same solution, not the optimal solution. The optimal solution is 2x50 + 25 or 3x35 + 20, there are perhaps more. Hi! Thank you so much for sharing thia. It helps me a lot. 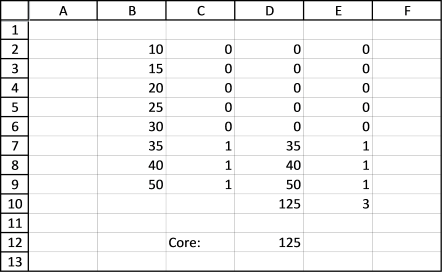 I want to ask, do excel solver can generate more than one combination of numbers for certain value? I was trying to see the various possibilities that can equal 10. Just by looking at it you can see there are several. However, the tactic in the instructions returned zeros next to all numbers except 6 and 4, next to which were the number one. Is this instruction not meant for this application? I need this for something more large scale, but I used smaller number for easy head math. If this is not the right procedure for what I am trying to accomplish, does anyone know what is? I am trying to follow your steps, but I get stuck at step 11. That dialog box doesn't pop up. What pops up is the same options box from your December 21, 2016 at 9:03 am post. (sorry couldn't post an image) I don't see anywhere to tick "assume linear model" Could you please provide instructions from step 11 with this other dialog box? 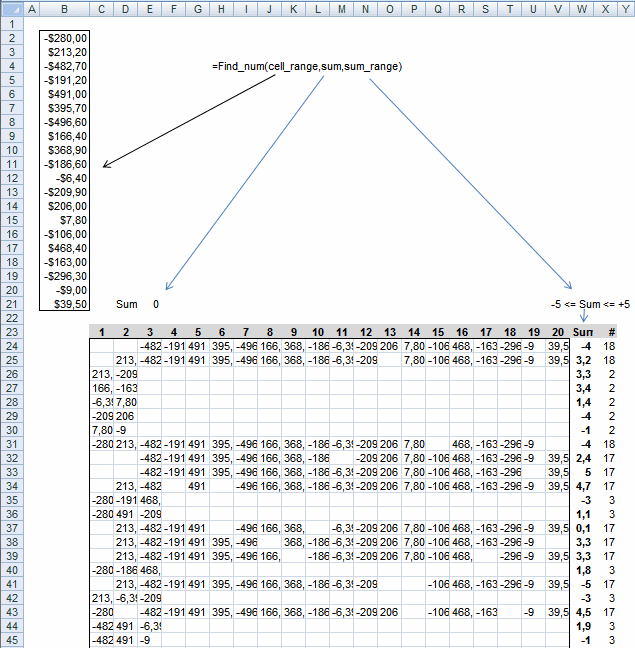 You are right, it (assume linear model) seems to be missing in later excel versions.